﻿Foodies! Relish Your Taste Buds With Some Mouth-Watering Delicacies At Top-Rated Eating Points In Hong Kong! Foodies! Relish Your Taste Buds With Some Mouth-Watering Delicacies At Top-Rated Eating Points In Hong Kong! Hong Kong, one of the most popular travel hub in World is a place which is known for its rich cultural background, tradition, and history. If you have been longing for a break from your hectic schedule for a long time, then you must plan a trip to Hong Kong, a place offering wonderful travel experience to be remembered forever. Hong Kong is hub of many beautiful beaches, stunning tourist attractions, holistic temples, shopping hubs and fine dining eating points offering traditional cuisines and welcoming ambiance. Foodies, while on their visit to Hong Kong must visit some of the famous dining points such as The Verandah Buffet, Pirata Hong Kong, Australian Dairy Company, etc., so as to taste some amazing food and drinks. HonestBee is the leading online store known for providing greatest quality grocery items and amazing restaurant deals in Hong Kong. Here, you will find best food deals of almost all popular fine-dines and top-rated restaurants. All you need is to simply browse through the list, choose your favorite restaurant and order food using special offers, discount codes and voucher codes. Given below is the list of popular fine-dining outlets of Hong Kong known for lip-smacking food to its customers. Capo is an ideal restaurant for all those foodies who wish to taste some well-prepared food just like their home. here you'll get to taste some authentic Italian, Mediterranean and European cuisine. From fresh, hand-made pizza & pasta to Buratta and Parma ham, you will get to taste everything over here. Furthermore, the ambiance of this place will let you feel like you are at home. Popular for its innovative Italian food in a dramatically stylish setting, Tosca is yet another widely-famous fine dining outlet addressed on the Level 102 of International Commerce Centre, Kowloon, Hong Kong. Majestic chandeliers, high ceilings, and stately fountains lend a very dramatic, Romanesque feeling to this place. Over here, one can relive the enchantment and passion for the most beloved operas of the world through the Tosca's inspired cuisine. Showcasing a mesmerizing panoramic view of Hong Kong Island and Victoria Harbour through its impressive wall of windows, Lobby Lounge will surely make your trip to Hong Kong worth travelling. Experience the dramatic and diverse world of dining with the range of lip-smacking food served stylishly. 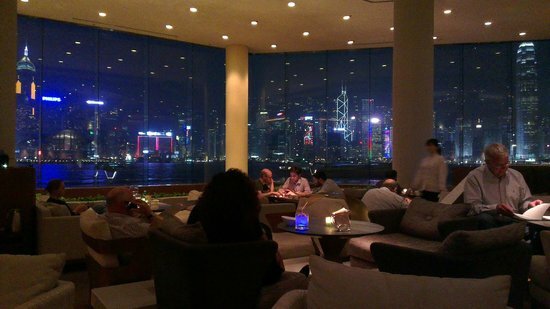 Travelers traveling to Hong Kong must not miss this most happening place especially the most entertaining evening time. HonestBee Voucher Codes will surely make your visit to Hong Kong worth visiting. This New Year Dazzle Your Complete Meal! Hong Kong Travel! Foodies, Must-Try These Lip-Smacking Desserts! Must-Try Hong Kong Food And Popular Places To Try Them! Sweet Tooth Cravings At Hong Kong Will Make Your Mouth Go Watery.. Take A Look!! Online Grocery Shopping Eases Out The Life Of The Humans!! Singaporeans Get Ready To Traverse Through Your Choice Of Cuisines!! Get Ready For Some Mouth Watering Appetizer At Hong Kong! !